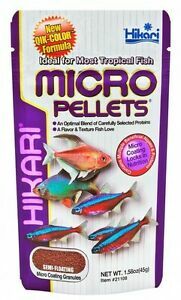 Details about Hikari Micro Pellets - .77oz to 2.2 # - Want It For Less? LOOK INSIDE AND SAVE! Hikari Micro Pellets - .77oz to 2.2 # - Want It For Less? LOOK INSIDE AND SAVE! Great Transaction ! Thanks !! Very good condition of products with nice pack! The seller is very responsible! Best price well pack and fast! Perfect! See You and thank you by-rite!